Occussi-Ambeno ... 2000 Year of the Dragon. Occussi-Ambeno: 2000, Year of the Dragon. 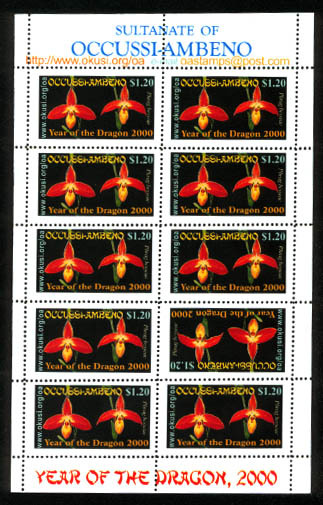 This set marks the Year of the Dragon in the Chinese zodiac. Most of the sheetlets were issued in the form of MS207, with one stamp inverted, but a very small quantity also appeared with all stamps correctly facing upwards, MS208. The photo of the orchid Phrag besseae in full bloom is by Mrs Adfat de Souza of Nitibe in Feripæga Province, who won the Novice Photographer of the Year award in December 1999. The stamps were printed by the Imperial Occussi-Ambeno Government Printing Office (KDPN), and they are perf 12. 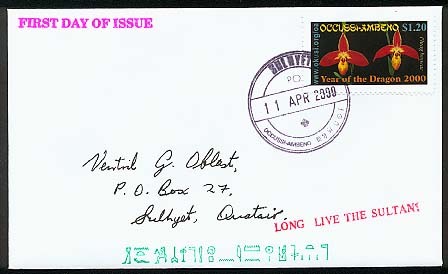 To view a First Day Cover, click here.